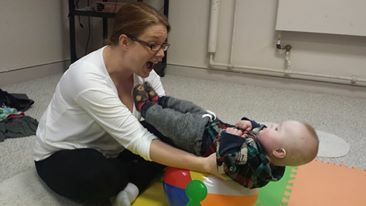 We have just one space remaining in our Tiny Tots Sensory in Saskatoon! This is our last space in our winter 2016 program. Thank you. This is a class all about play and sensory based learning! We will explore sensory play through various sensory baskets, bins, scarves, ribbons, balls, bubbles and other items while supporting this learning though various signs. The sign language learning will be minimal as the focus will be on whole child development and sensory learning. This class will include music and movement activities! Price: $55 which includes for the 4 week class of 50 minutes, and graduation certificate. Please note there is no requirements for this class. However, the ASL signs learned will be minimal as the focus is of the tiny tots sensory class.